"Is this the Chain Chomp... is it just Level 10..."
If there was any justice in the world, this video would be more popular than 50 Chewbacca moms. But we live in a world bereft of justice, but full of beauty true. 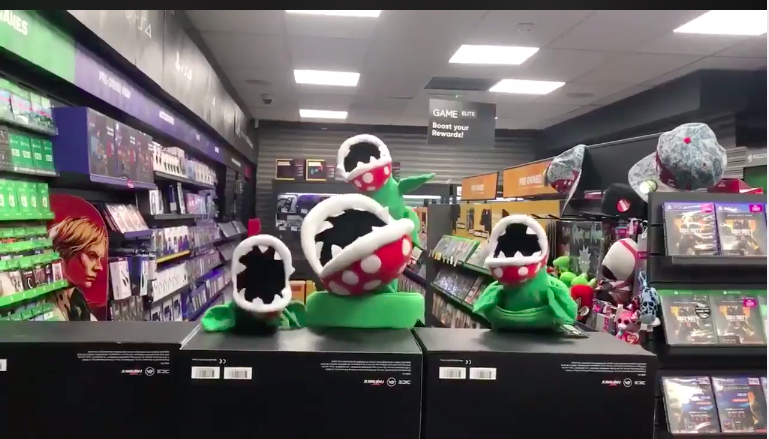 So, we present to you, a video of someone in a Gamestop who managed to puppeteer four Piranha Plants — that Super Mario villain turned Super Smash Bros favorite — into singing Queen’s Bohemian Rhapsody. Gaze upon this beauty. I mean, with all the strangeness they’re doing a better job than that Rami Malek Queen movie did, right? The original video can be viewed on Facebook here, and an embeddable YouTube link can be seen below. Bless the Pirrahna Plants, bless GameStop for creating the kind of environment where a Piranha Plant can simply sing its little chlorophyll based heart out, and I’m glad that Super Smash Bros made a world where this red and white little rascal is the celebrity we always knew he could be. Also… I just want to bless Queen and… bless Wayne’s World, for without their influence, would we even be watching goofy characters singing Bohemian Rhapsody at all!? Super Smash Bros: Ultimate is coming out December 5th and it is the only good massive cultural thing to happen in 2018 in my opinion. Anyway, what do you think of the video? Let us know in the comments or on Twitter at @WhatsTrending.